Piper Bayard is an author and a recovering attorney. Jay Holmes is a forty-year veteran of the military and intelligence communities. Together, Bayard & Holmes write espionage fiction and nonfiction. 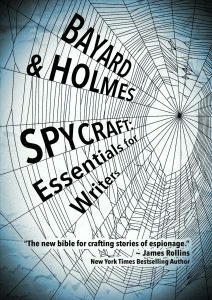 Their upcoming nonfiction release, SPYCRAFT: Essentials for Writers, covers everything from what the main intelligence agencies do and where they operate to honey pots, sleeper agents, enhanced interrogations, and more. Now on sale at Amazon! I have to admit I wasn’t sorry to hear they actually had to pay YOU because it was a mistake on THEIR part. The IRS is ridiculous but that is the case with anything remotely related to government. Thanks for sharing. I will say it was quite the relief that it turned out that way. I’ve been audited at least three times through the years, and only once did I end up having to pay more. The other times, they had to refund money to me. That’s awesome! I hope the refunds amounted to more than what you had to pay that one time. Great story! I have one to share as well. This year we hired an accountant, for the first time ever. 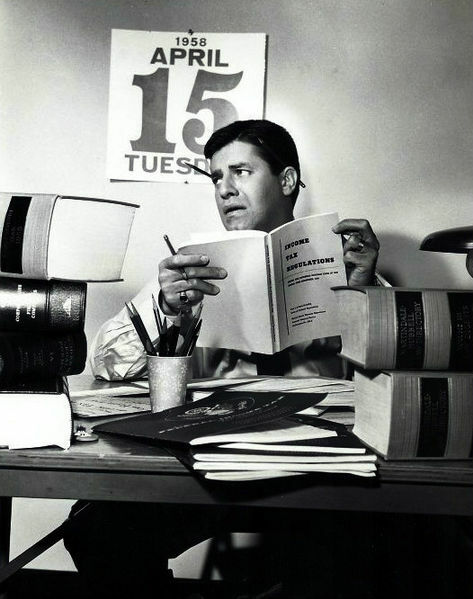 We hadn’t heard from him and it was now Friday the 13th–coincidence? I think not! I admit we’re Luddites. We have a fairly simple phone with an answering machine. Recently our phone service provider, nameless here forevermore, “upgraded” our service to include voicemail. They neglected to tell us how to access said voicemail. I called the accountant first thing Friday morning and was assured by his office that he would call back shortly. In the meanwhile, my brother called and I absentmindedly picked up the phone. As soon as he started talking I heard two beeps which meant another call was coming in. I have no idea how to switch calls in the middle of a preexisting one. And sure enough, the message went into the voicemail box that I don’t know how to access. Frantic, I called my provider–which apparently employs only robots–to get access to the embargoed voicemail. The friendly robot said the service was working fine and is there anything more I can do for you? My nails already bitten down to the first knuckle, I call the accountant’s office. He isn’t in, but they give me his cell phone number. I dial with what’s left of my fingers only to receive the message that his voicemail box is full. He doesn’t know I returned his call, and he assumes I heard his voicemail message, which I hadn’t/couldn’t. I call his office yet again. They assure me his voicemail box is never full. “But it is!” I persist. One of them says, “I’ll let him know you called.” How they will do this when he’s not in the office and his cell isn’t taking new clients, a Luddite like me can only guess. Meanwhile the day is getting on, sunlight’s fading. The IRS is greedy for what we owe. Their office closes at five. The phone rings and I pounce on it like a desperate lover. My accountant assures me everything is fine. His people will send a secure email this afternoon. We’ll make the deadline. Uncle Sam will become richer than he already is. We all win. I hang up and begin to watch my inbox compulsively. Five o’clock rolls around and no email arrives, secure or otherwise, no matter how frequently I refresh the page. It looks like a frazzled weekend with TurboTax and paying twice for one mistake. I love America! Steve! So good to see you! Bless your heart! As they would say back in the old country (Texas Panhandle), automated phone services are “of the Devil.” I think we have until the 17th this year. At least there’s that. Thank you for sharing your story. I feel for you. Good luck! Thanks for the word “luddite.” It describes me to a T. I’ll have to start using it. Yay you! I was told by former IRS agent turned author to ALWAYS fight back. Back in the 90’s, the Congress passed a Taxpayer Protections law. Sorry for the stress though. Be sure to frame the apology letter from IRS. It may be the only apology you ever get from them!